6. Make a new appointment. 9. Add a new contact. 14. Toggle Connectivity settings (WiFi, Bluetooth, Airplane Mode, Mobile Network). 15. Built-in calculator and voice recorder. 16. Test your phone's hardware (touch-screen, system info and accelerometer). 1. CANNOT pin any custom tile nor resize/move existing/default tiles. 2. CANNOT change background wallpaper. 3. CANNOT make this your default home-screen for your phone. 4. Tiles show static content and DOES NOT show real time count of items or notifications. 1. 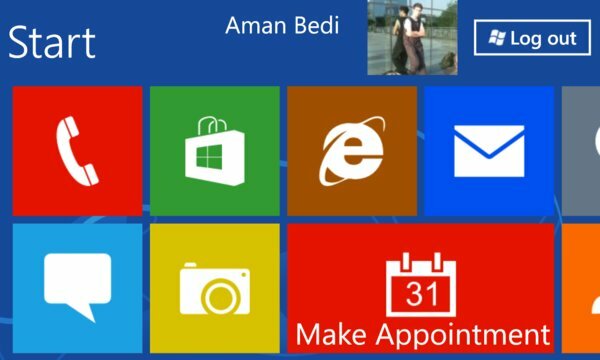 Log-In with your Live ID to get your name and photo displayed in top-right corner just like in Windows 8 start menu. (User credentials are NEITHER stored inside the app NOR exploited by any means). 2. 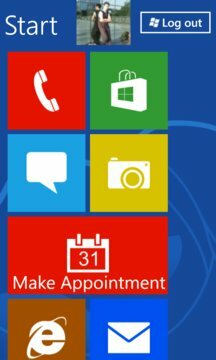 The colour of live tile changes as you change your phone's accent colour (app must be re-launched to make this change happen when you change your accent colour). 3. Supports both portrait and landscape mode. 4. 2 sizes of Tiles to replicate the feel of Windows 8 start menu. NOTE :- This application is purely meant for entertainment purpose and is NOT related to Microsoft in any way.